I have been sewing professionally for more than 15 years, specialising in bridalwear since 2003. I graduated from Wimbledon College of Art with a BA(Hons) in Costume design. My family say that I am never seen without a needle. For my work I make beautiful and induvidual dresses for weddings, parties and special occasions, and on holiday I do cross stitch! I live with my husband and two lovely children, working from my studio at home. My first memory of sewing is at just over four years old, on the floor of my mother’s sewing room, making a doll’s dress (which I still have). I sewed at home for fun, at Brownies for badges, at school for GSCE and A-level, fashion shows and for my friends’ Leavers’ Ball dresses. I joined the National Youth Theatre’s costume dept. and sewed through 6 summer holidays in dusty theatre wardrobes and back stage. I sewed my way through art college while running a small shop selling clothes and jewellery that I had made myself. In my early twenties I designed and sewed hundreds of costumes for a Yorkshire based Youth theatre ‘Livewire’. At university I purposefully took the design (not sewing) course and pushed my research and design skills – I felt I could already sew! While at university I got the bug for bridalwear by working part time for a wedding dress shop as their alterations lady. 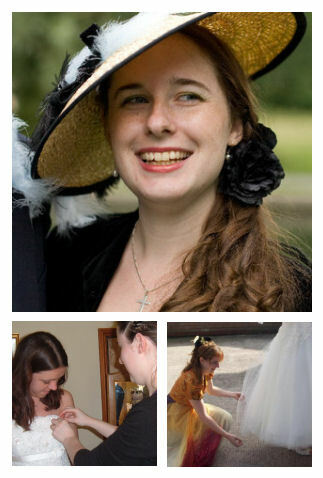 After graduating I worked briefly in film and television before concentrating on being a bespoke wedding dress maker. Other projects include collaborative ‘styled photoshoots’ with other wedding professionals, teaching at the London School of Fashion and with a local sewing school and costume design for local theatres. My own wedding in 2007, and yes I made everything you can see here (except shirts, trousers and stoles).